Please join ACCG’s Standing Committee on Mental Health for a Summit on August 1, 2018, at Goodwill’s Anderson Center in Macon-Bibb County from 10:00 AM until 3:00 PM. ACCG encourages e very county to have at least one person attend this upcoming ACCG event to ensure you are informed about the growing mental health and substance abuse issue and how it is impacting your community. The registration fee for this event is $25. County commissioners will earn six hours of continuing education credit for attending this event. To register click here . Click here for the agenda. For more information contact please contact Nicole Logan ( nlogan@accg.org | 404. 522.5022 ). Registration is now available for the summer policy committee meetings! These meetings are designed for the association's seven standing policy committees to develop their positions on particular issues for incorporation in the 2019 ACCG Legislative Agenda. Meetings are taking place in August across the state. Click here to register for the meeting(s) of your choice. ﻿Please contact Nicole Logan ( nlogan@accg.org) if you have any questions. ACCG is happy to partner with the Georgia Municipal Association on an upcoming series of five workshops across the state on telecommunications issues currently facing Georgia’s local governments. Topics will include the technology and equipment needed to provide wireless and fiber broadband to both urban and rural areas; current telecom law; franchise and right-of-way (ROW) agreements; and federal and state efforts to preempt local government management of the ROW. County commissioners and staff are encouraged to attend. For more information on these workshops, dates and locations, and registration, please click here. Registration for the 2018 Legislative Leadership Conference (LLC) is now available! This year's conference will take place October 10-12 at the Jekyll Island Convention Center in Glynn County. Georgia's county officials will embark on three days full of continuing education opportunities in the ACCG Lifelong Learning Academy and hot topics session. County officials will also engage in policy discussions to finalize the 2019 ACCG Legislative Agenda and Legislative Priorities. Contact your county clerk to register today! For more information on the 2018 LLC click here . With policy meetings right around the corner, now is the time to recommit to serving on an ACCG Policy Committee! ACCG has seven standing policy committees and membership is open to all elected and appointed county officials. Policy committee meetings will take place this August and your participation is needed to shape the policy positions ACCG will advocate for leading up to the next legislative session! Click here to view the committee descriptions . Sign up today by filling out this form. Two new county resource pages are available on the ACCG website. County officials and staff now have access to information on the 2020 Census and the Opioid Crisis. Each page contains state and national resources and information. The pages can be accessed via the County Resources sub menu under the Georgia Counties tab on the ACCG homepage. Click here for more information. The 2018 Georgia General Assembly passed HB 489, subsequently signed into law by Governor Nathan Deal. Effective July 1, 2018, any bid or proposal extended by a county, city or board of education for goods and services valued at $10,000 or more, or public works contracts for over $100,000, must also be posted on the Georgia Procurement Registry - at no cost to the local government. On June 25, the State Department of Administrative Services (DOAS) sent out the attached notice unveiling this Website containing information on the new law; frequently asked questions; how to register for, access and utilize the Georgia Procurement Registry; available training materials; and other assistance. The goal is to aid local governments in complying with this new state requirement. DOAS has also established a procurement help desk (404-657-6000, or procurementhelp@doas.ga.gov) to sign up for future DOAS communications, answer any questions, and provide additional information in this regard. On June 22, Georgia Lt. 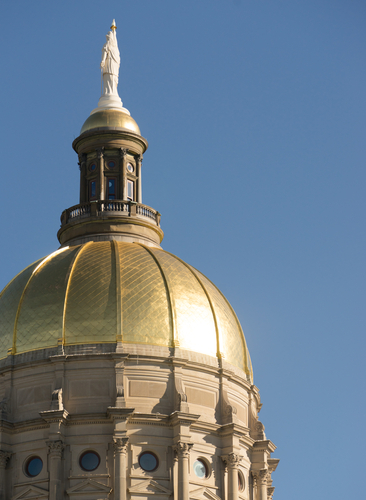 Governor Casey Cagle appointed members of the Senate Study Committee on Local Government Fees. This study committee is aimed at promoting fiscal responsibility at the local government level by determining excessive fees, ensuring that local tax dollars are going as far as possible, ensuring efficient and fair local governance, and minimizing bureaucracy. To view the press release, study committee members and other information, please click here. On June 4, 2018, the Georgia Supreme Court issued an opinion in Hoeschstetter v. Pickens County which partially clarified how public hearings, proper notice, and record should be administered by counties and cities in making zoning decisions. While the ruling lacks some clarity, this article from the Georgia Chapter of the American Planning Association provides useful guidance on how to better ensure that local zoning decisions meet legal challenge. In addition to our nation’s wireless providers seeking state preemption of local government management of local right of way (having succeeded in over 20 states thus far) and petitioning the Federal Communications Commission for the same, providers have now commenced their third front via legislation introduced in the U.S. Senate. All efforts, at all levels, are aimed at being granted nearly unfettered access to local ROW for the deployment of small cell structures, antennas and other equipment to roll out future 5G technology at minimal costs and disturbance. Read more from NACo here. In late June, the U.S. Supreme Court issued its decision in South Dakota v. Wayfair which opens the door for Georgia to collect more state and local sales taxes from online transactions. This recent ruling on sales tax collection on remote purchases is a win for Georgia's county governments. To learn more about this, including the implementation of House Bill 61, check out ACCG’s analysis here. Does your county have a transportation project need that is adjacent to, or provides access to, federal lands? If so, check out the Federal Lands Access Program (FLAP). The Call for Projects application period is open July 16, 2018 through October 15, 2018. An estimated total of $5M will be available for programming in Georgia. Program details and tips for preparing a good FLAP application can be found here . ﻿for a Summer Policy Committee Meeting!